Comments - Charming scene of a monkey performing at the Imperial Palace, dressed as a samurai complete with woven hat and miniature swords. 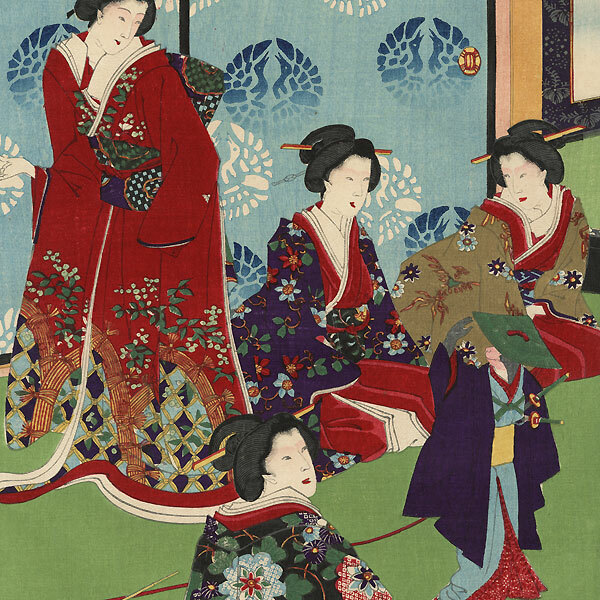 On a platform at right, the young Prince Yoshihito and his sister watch as the animal tips its hat, surrounded by ladies-in-waiting and palaces attendants. The monkey trainer kneels at left as the musicians beside him play shamisen and drum. Three beauties watch from the doorway of the room at left, smiling and giggling. Handsome color and detail in the elegant kimono and interior, with touches of embossing and burnishing. 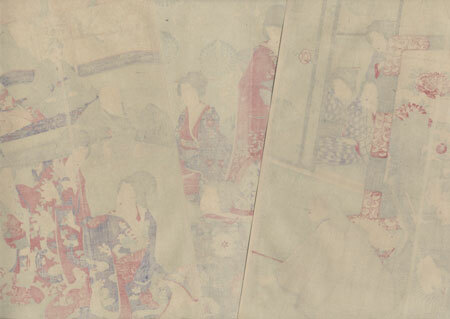 A wonderful Chikanobu subject, rarely seen. Image Size - 13 7/8" x 27 7/8"
Condition - This print with excellent color and detail as shown. Three separate panels, backed with paper. Slight toning and soiling. Please see photos for details. Good overall.